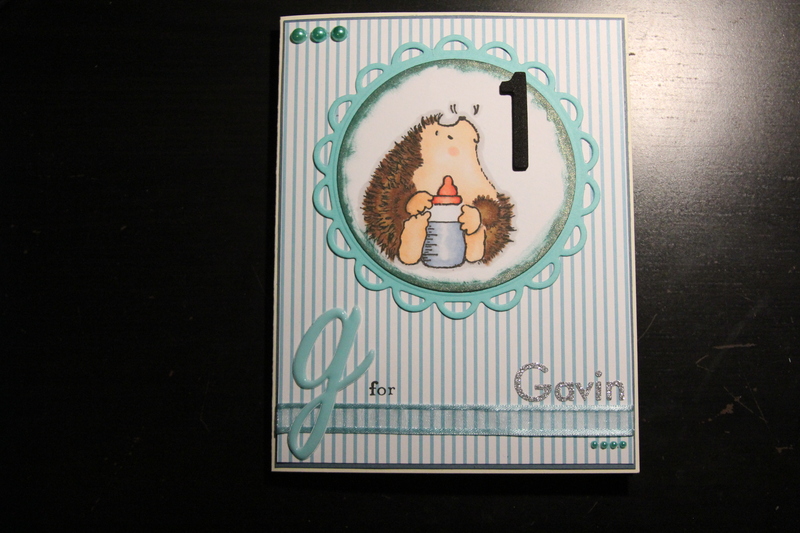 I’m practicing on some baby cards since my sister’s pregnant and due in September. I’m going to be an auntie for the first time and I’m super excited!! 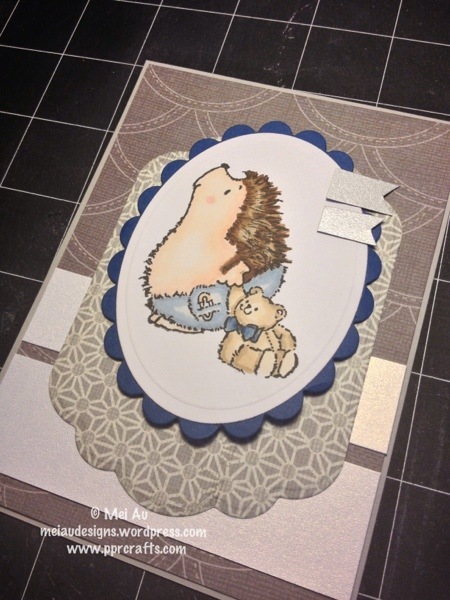 I’ve used scrapbook paper from My Mind’s Eye – Wild Flower 12 x 12 paper pad, cut down to smaller pieces to make this card. 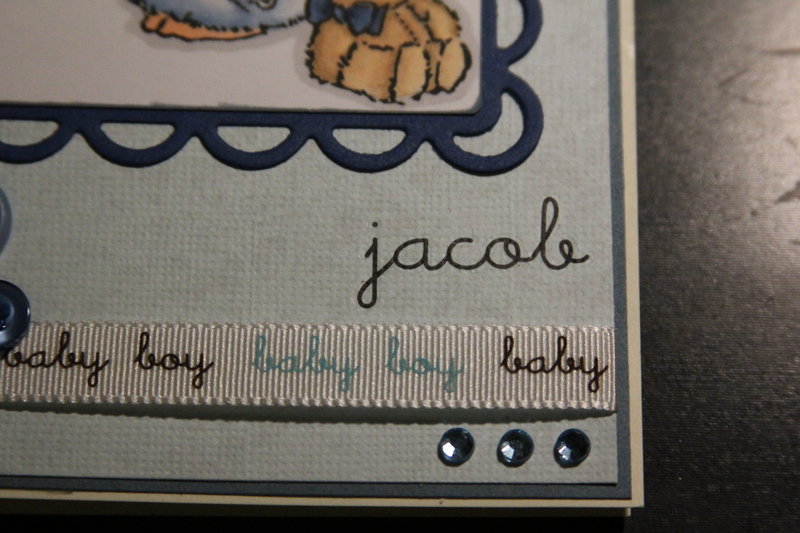 Love how the paper has this textured look to it! 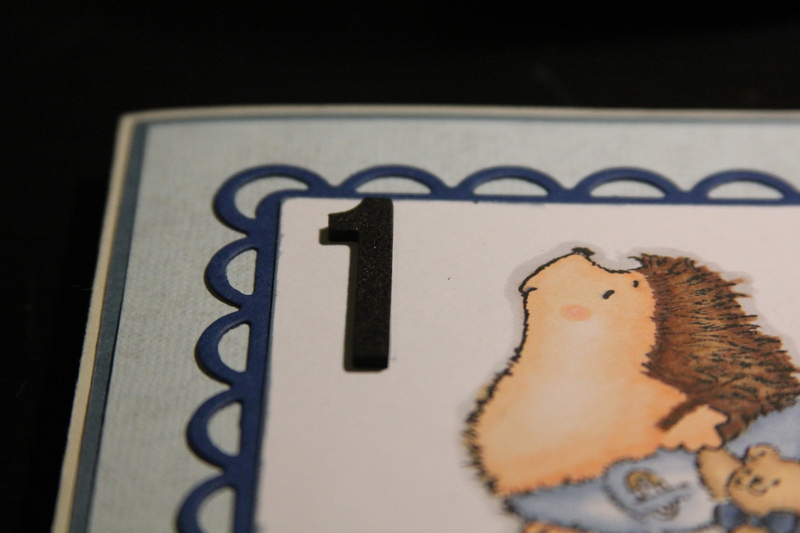 I’ve also used the image from Penny Black – Bundle of Joy. 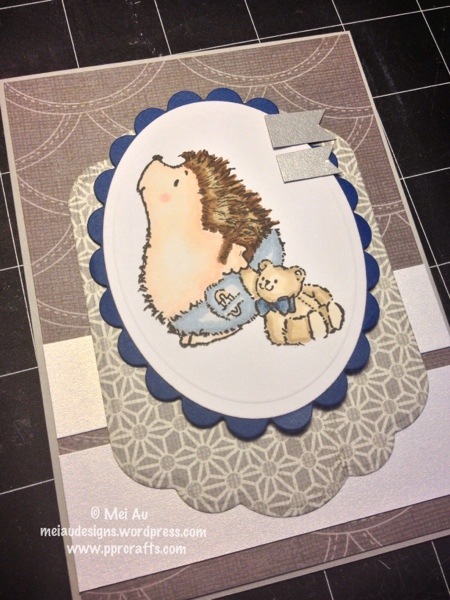 Those hedgies are so cute! 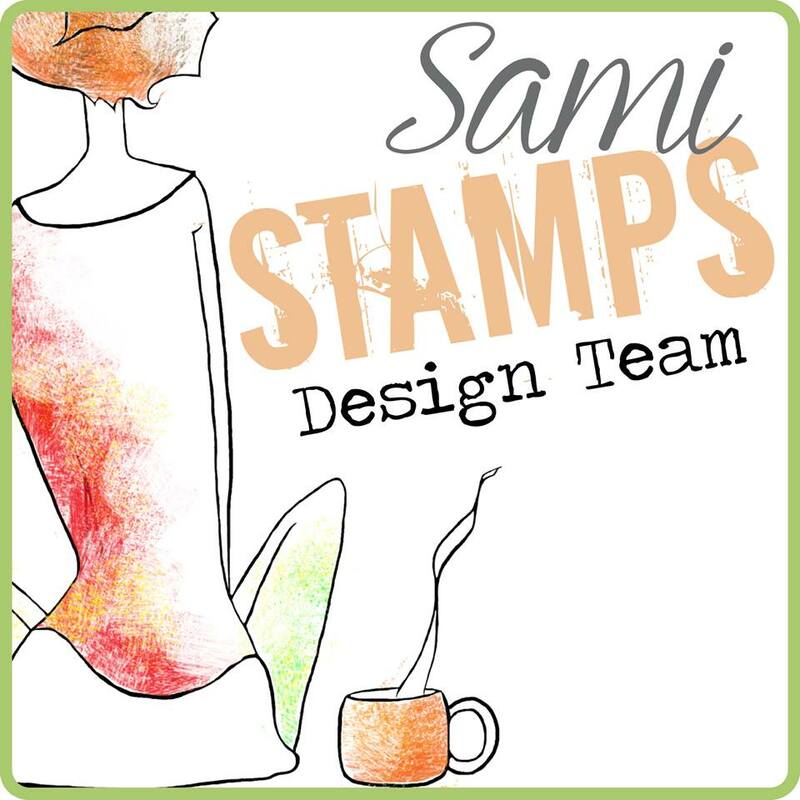 For my card using sponsor The Stamping Chef image click here! 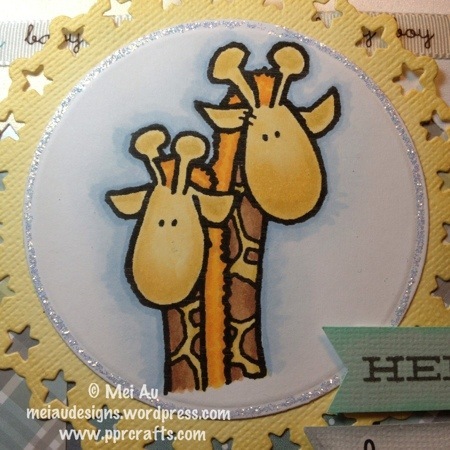 The image I used from Eureka Stamps is Giraffe Train. 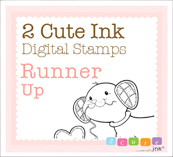 Remember to play along at Love to Create for a chance to win 5 images from Eureka Stamps! 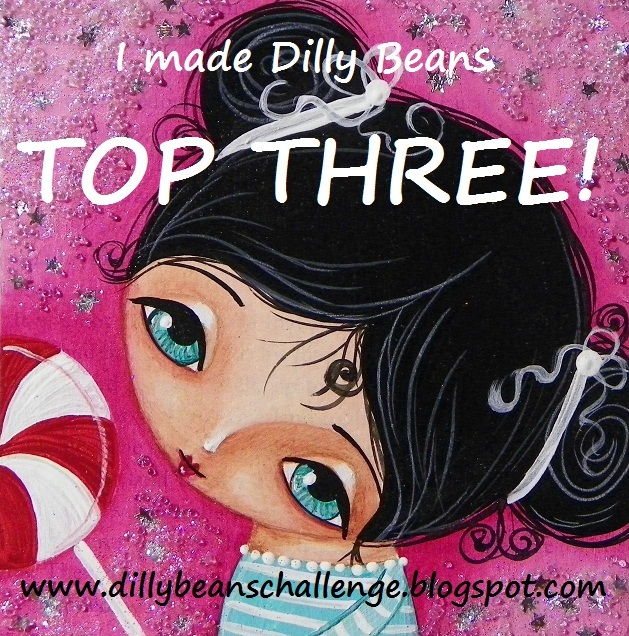 This week’s challenge at Love to Create Challenge blog is to use three favorite colors! The colors I chose were Blue, Red and PINK! 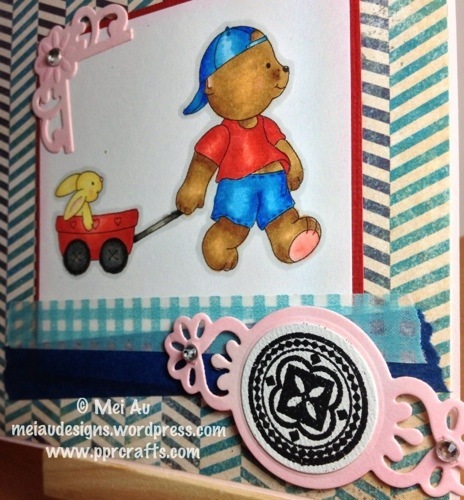 Who said you can’t use pink on a boy’s card!? 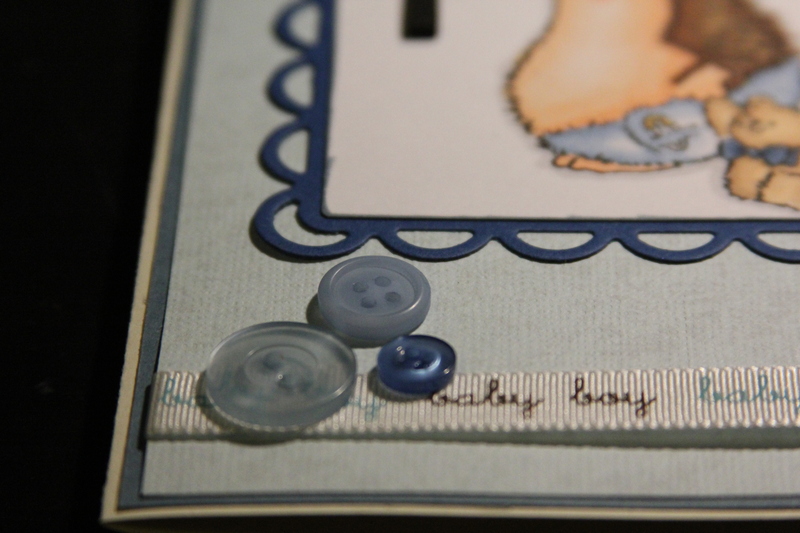 I haven’t had a need to make any baby cards recently. 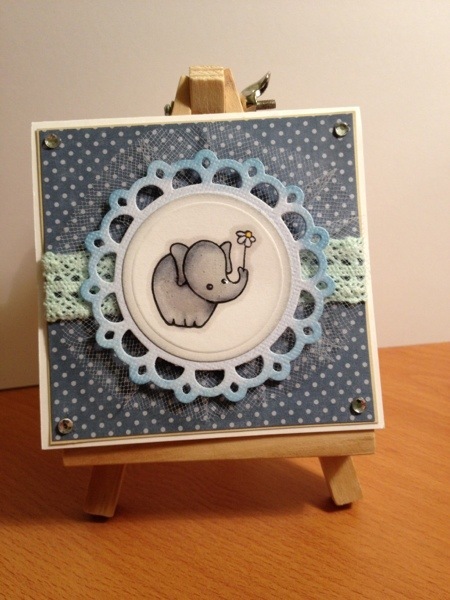 But since there’s a challenge, I whipped out my baby stamps and used this elephant one from Stamendous – Baby Invite. Added a bit of Ranger’s Gloss for extra shine. 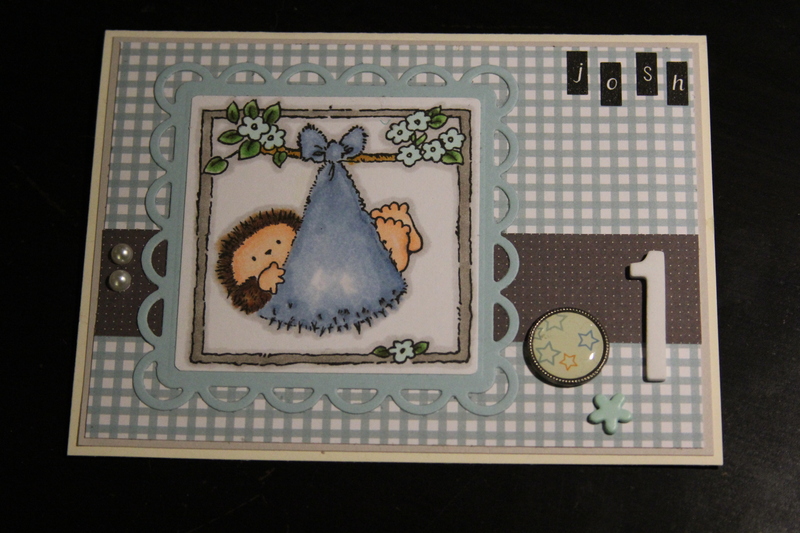 Stampendous actually has a few stamp sets that are really good for baby cards. 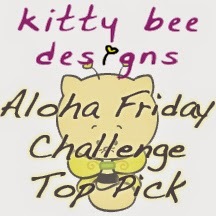 I used the sketch from Papertake Weekly, sketch #51. Yes. 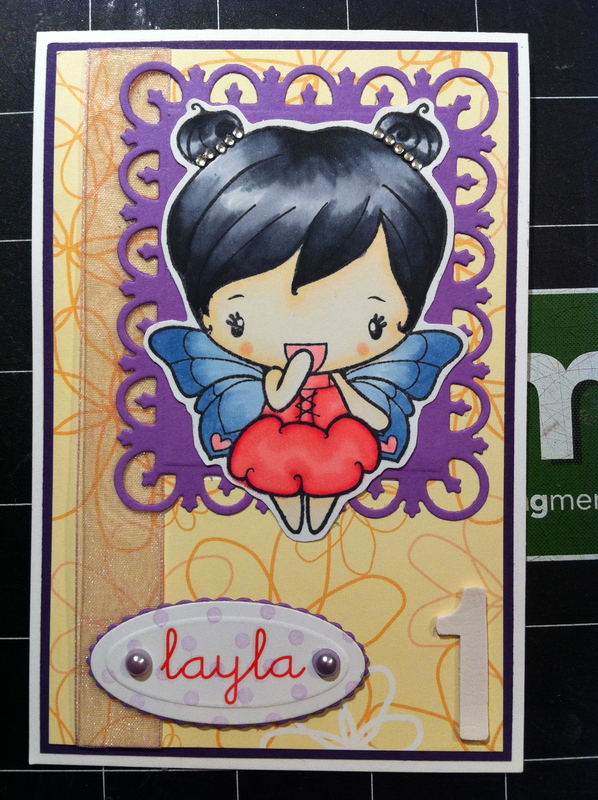 As mentioned in the previous post, I have created a card for my friend’s daughter Leila….Ok, he never told me how to spell the name and I assumed it was spelled Layla. Its ok, at least I’ll remember next year? 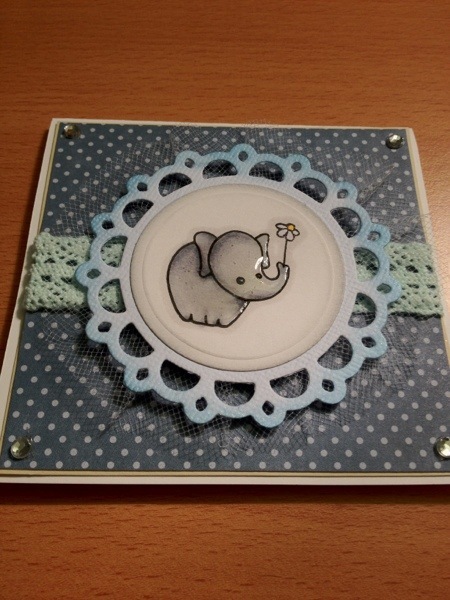 I’ve used the following products to make this card: The Greeting Farm – Flutter Anya ; Spellbinder – Fleur de lis Squares, Petite Ovals and Petite Scalloped Ovals ; American Crafts – Daiquiri (Vinyl – White), S.E.I. 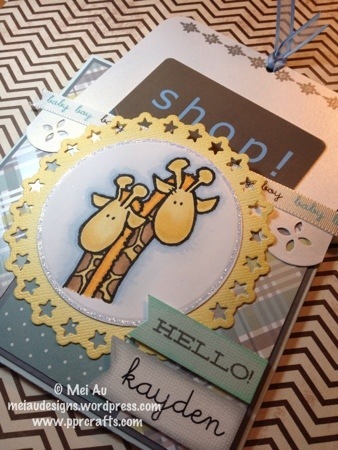 – Chick a dee scrapbooking pad ; Hero Arts – Dots: Cling Stamp (used on background of Layla), Hero Arts – Rhinestones: Clear. 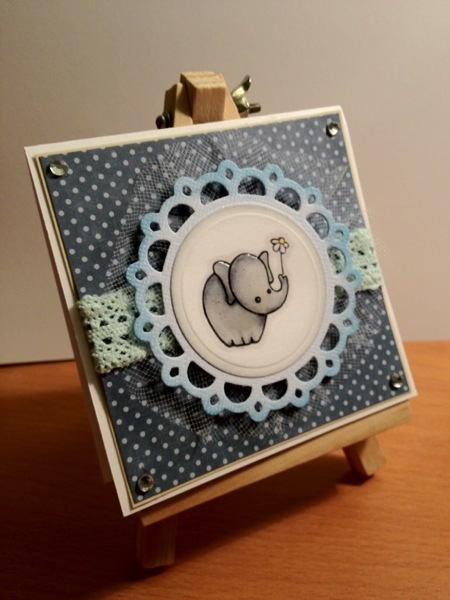 This is the second card of the baby series~ I think I’m starting to get the hand of baby-card making ^^ I really hope the people that receive the cards would be very happy receiving them 🙂 I had someone tell me that they framed their card, it was really nice to hear that people appreciate your hard work every once in a while. The products used to create this card are as follows: Penny Black – Bundle of Joy, Spellbinder – Lacey Circles, American Crafts – Thickers Puffy/Glossy Alphabet: Rainboots (Powder), American Crafts – Bleu Ribbon, Making Memories – Mini Shimmer Alpha Silver (Gavin), American Crafts – Thickers Foam Alphabets: Daiquiri (Black), Hero Arts – Mix Rhinestones (Foliage), Copics. 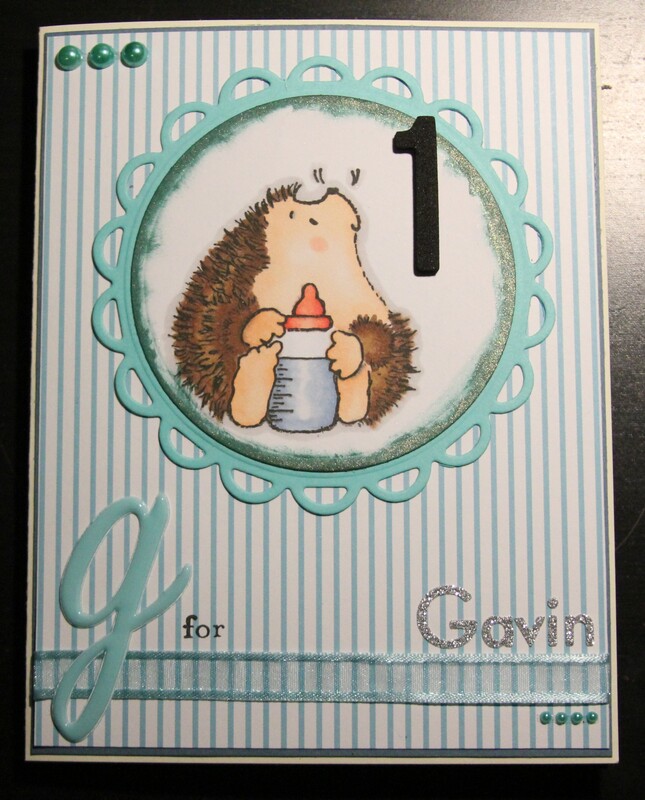 This is one of my first baby cards using Copic and I have to say its actually pretty cute! 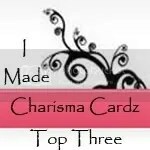 I can’t wait until I start on the following 3 that’s been requested from my friend. 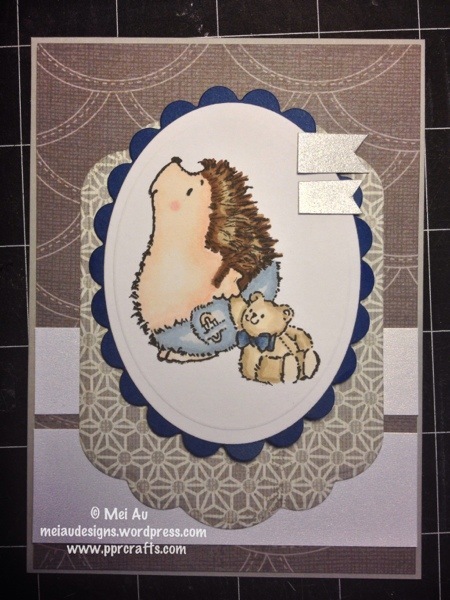 The image is from Penny Black‘s Bundle of Joy set, their hedgehog character is one of my very favorites~ adorable! 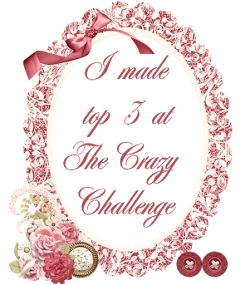 The products used to make this card are as follows: Spellbinder: Lacey Squares, American Crafts: Thickers foam alphabet – Daiquri (black), S.E.I. 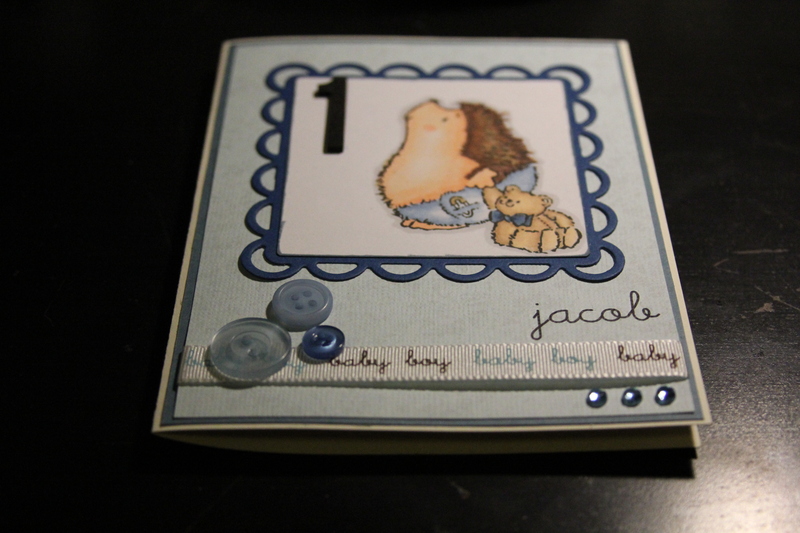 – Wintersong Scrapbook Pad, American Crafts: Mini Marks – Kate (Jacob), American Crafts – Baby Boy Ribbon, Hero Arts: Rhinestones – Blue, Copics. Since this is my first post I decided to showcase my favorite card. 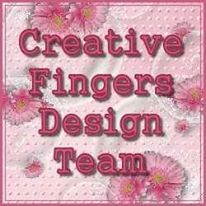 This card was made for one of my best friend’s daughter Kaylee. She’s a little angel and this card is just as cute as her! This was made almost a year ago, enjoy!